The boys turned sixteen today. A momentous occasion, as they identified they can now get their driver’s licence and legally buy a chainsaw. I have given them the odd sneaky driving lesson down at the rugby club car park and environs, however I am not keen on them using my chainsaw. As a whanau we went out for dinner. 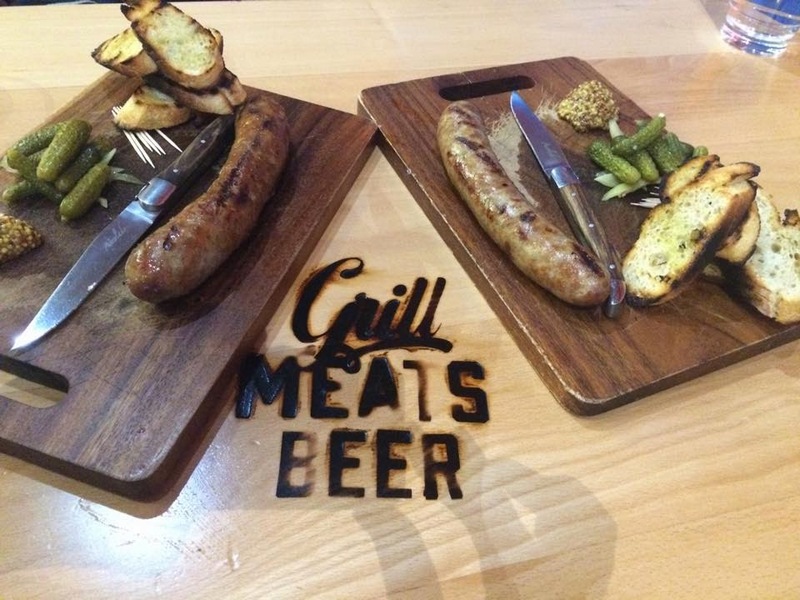 Using my guidance, and knowing the boys are partial to meals with lots of meat I suggested we went to Grill Meats Beer in upper Cuba St. This is a newish eatery established by Steve Logan from Logan Brown fame. It aims to serve sweet and spicy food in an open atmosphere, the grill is in the centre of the eatery. The kids and I had burgers for mains, while my wife ordered ribs. The meals were all very good. As a starter we ordered pork and fennel sausages. Being a family that has grown up with a sausage obsessed father, it was decided that for all the family to fully sample the snarler we would need to order two. These are a great meaty sausage. They are a fine to medium grind. The pork is the predominant taste. A slight fennel piquant is also present, this is strongest as a short lived after taste. I would describe these sausages as pork with a minor hint of fennel. The sausages were served with whole grain mustard and pickles, along with toasted bread. When the sausage is combined with mustard or pickle this dominates and over powers the fennel flavour. The whole family enjoyed the sausages, they thought that they were an impressive pork snarler that would appeal to the masses. Grill Meats Beer has an open kitchen and when I paid the bill, I asked the maître de a few questions, she handed me to over the chef. He said they made the sausages from pork shoulder and back fat, they mince all the meat, add ground fennel and black pepper. The ones we ate had been made that morning as they had sold out last night. So happy birthday to my sons, driving lessons will follow, but the chainsaw may have to wait quite some time.